VSF Europa recognizes Food Sovereignty (FS) as a guiding principle for its actions. At the same time VSFE, through its long experience, strongly supports Small Scale Farming systems to enhance Food Sovereignty. Globally, 75% of the people suffering from hunger are small farmers and inhabitants of rural areas. A huge amount of them depend on a few courtyard heads for daily food provision. Therefore, no successful program against hunger can ignore the urgent need to support the smallest household farming activities, as well as SSLF systems. VSF Europa recognizes Food Sovereignty (FS) as a guiding principle for its actions. FS is a complex concept that goes beyond food security and encompasses not only a guaranteed access to food, but also democratic control over the food system—from production and processing, to distribution, marketing, and consumption. The FS concept was improved and modified many times over the last 15 years, leading to the current definition, adopted through the "Declaration of Nyéléni", stating that “Food sovereignty is the right of peoples to healthy and culturally appropriate food produced through ecologically sound and sustainable methods, and their right to define their own food and agriculture systems.” At the same time VSFE, through its long experience, strongly supports Small Scale Farming systems to enhance Food Sovereignty. The past half- century of highly intensive agricultural expansion has stricken the world’s peasantry, dispossessing them of land, water, and genetic resources through processes of enclosures and displacement. These processes threaten not only equitable income distribution but also the natural equilibrium of the environment and biodiversity. There are many highly productive, equitable, and sustainable alternatives to the present industrial practices and corporate monopolies holding the world’s food hostage, and one of them is Small Scale Livestock Farming, a production method bearing the imprint of the structural link between economic activity and family structure. There is a wide variety of SSLF systems, with huge differences between examples, and dependent on the context. Even if there is a huge variety between SSF systems, they all withhold a common pattern because they are all based on a strong relationship between individuals involved in ownership, management and farm work. Also, the strong relationship between generations concerning the knowledge transmission about the local environment, with its peculiar plants, land and livestock management practices, shaped after centuries of exchanges and trial/error experience, is essential in SSF practices. This production method needs to be put on the agenda of international agricultural policies for many reasons. First of all because it provides jobs and decreases rural exodus, it implies a larger amount of production units to enhance a more equitably distributed income. Furthermore, it is more effective in improving livelihoods and better quality of life for poor rural households. An increase in direct income at a local level would eventually encourage investments, therefore contributing to vitalize the economies of rural areas. Small scale livestock farming is also very important because of its positive and sustainable effects on the environment and its relationship with social aspects. 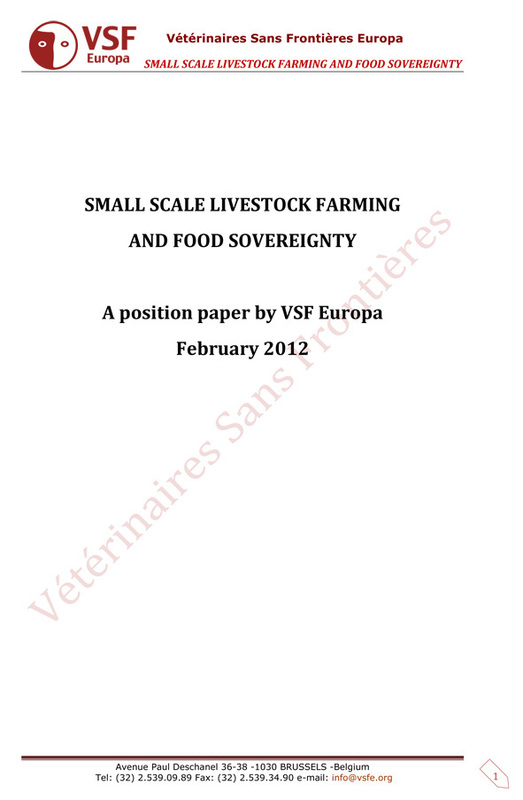 Summarizing its main characteristics clarifies the link between small scale livestock farming and food sovereignty. Globally, 75% of the people suffering from hunger are small farmers and inhabitants of rural areas. A huge amount of them depend on a few courtyard heads for daily food provision. Therefore, no successful program against hunger can ignore the urgent need to support the smallest household farming activities, as well as SSLF systems.